There are 285 million people in the world with visual disabilities (over 400,000 million in Spain), 74% admit to having difficulty performing basic activities of daily living and only 21% live alone. At the same time, 88.4% of this group in Spain has a smartphone and considers this technological device the most adapted to their needs (above the television, computer, tablet or e-book). 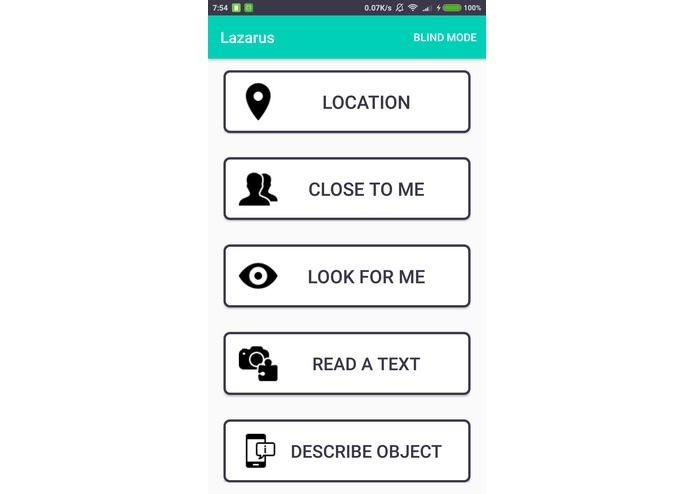 Lazarus, a mobile application for Android that helps blind or visually impaired people to move around the city and perform simple tasks of daily life without the face-to-face help of a caregiver, family member or friend using only basic tools such as geolocation, voice recognition or the camera. Blind users: people who need help in situations of confusion (like getting lost in a public space) or emergency (read a warning text, for example). Helper users: volunteers willing to "lend" their eyes to those who can not see. Its function is to answer the questions of blind people by transcribing texts or describing images. What can the app do for blind people? 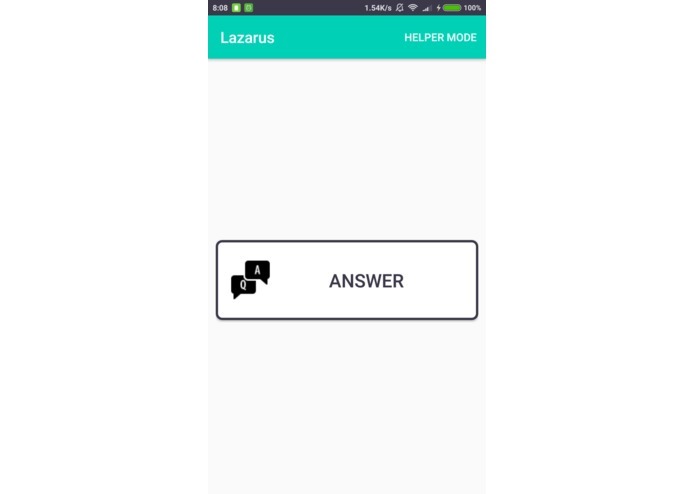 Lazarus has 5 basic options that can be used manually or with simple voice instructions. 1. 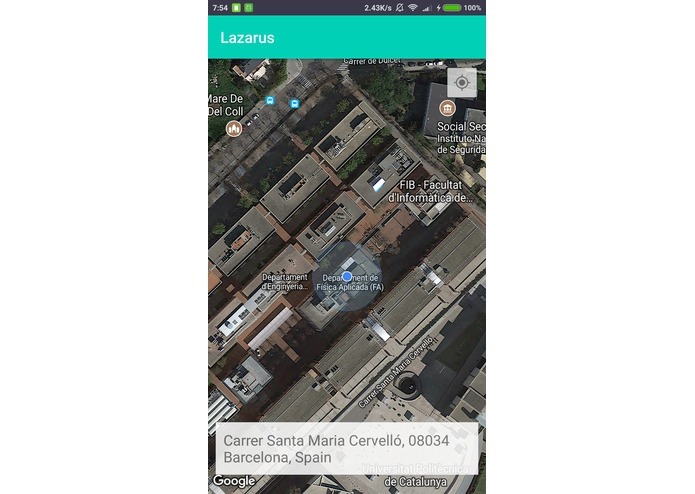 Location: A lost user can instantly know where he is thanks to simplified maps, specially designed for people with visual disabilities, and GPS. 2. 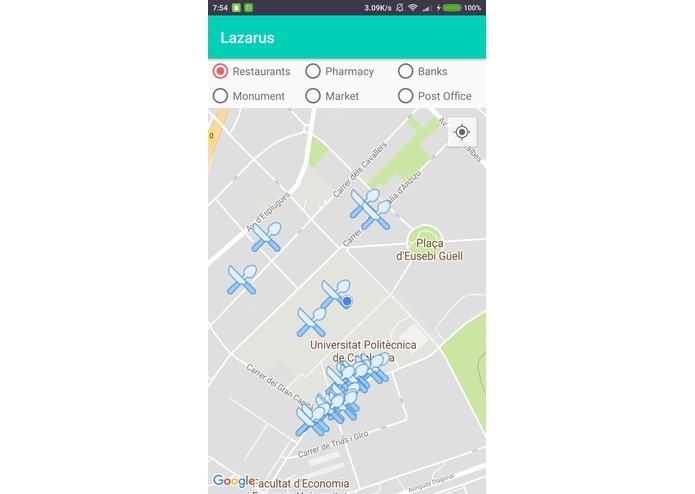 Close to me This option indicates relevant spaces that are around the user in an area of ​​500 meters as: pharmacies, banks, post offices, supermarkets or coffee shops. 3. Look for me This option allows the user to ask other people what is happening around him eg in situations of confusion or danger (knowing if a food is in a good condition or some pills without a box are the ones he have to take). 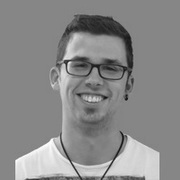 The user only has to take a photograph and thanks to the help of volunteer users, will solve his doubts. 4. 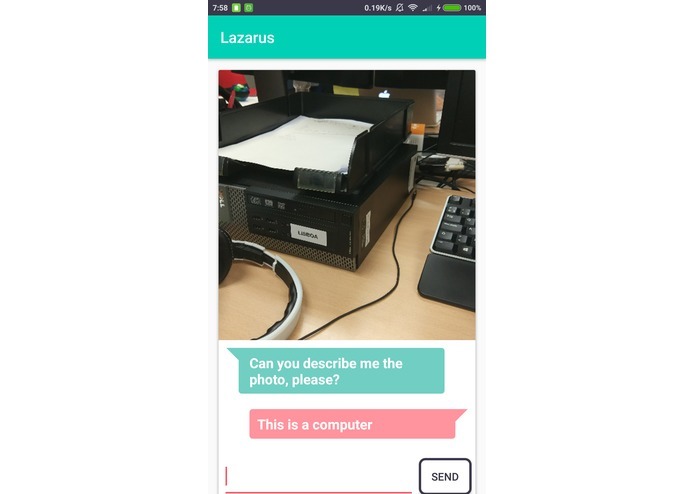 Read text Lazarus automatically translates written texts into voice messages through an OCR process. 5. 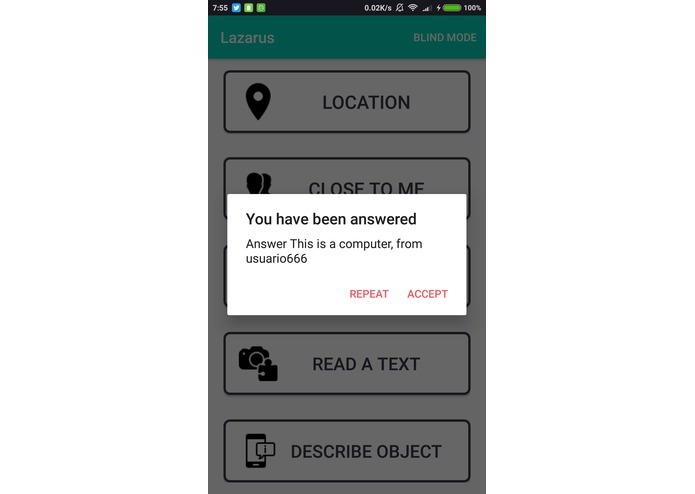 Describe object Lazarus can recognize objects from the real-world in order to help you with your daily issues. 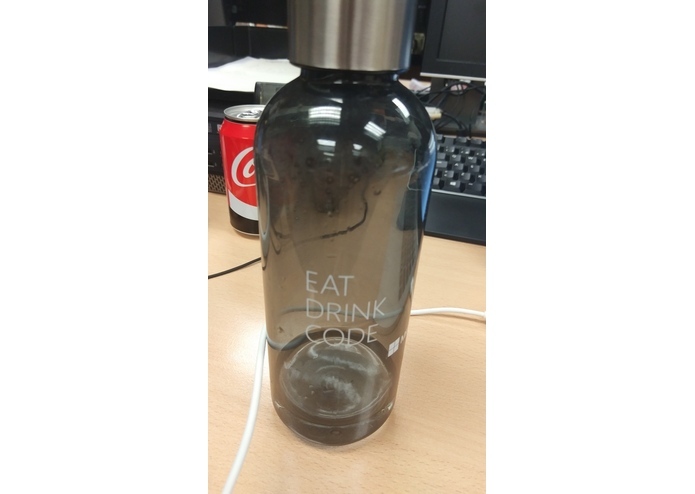 On the server side we used Flask with MongoDB. 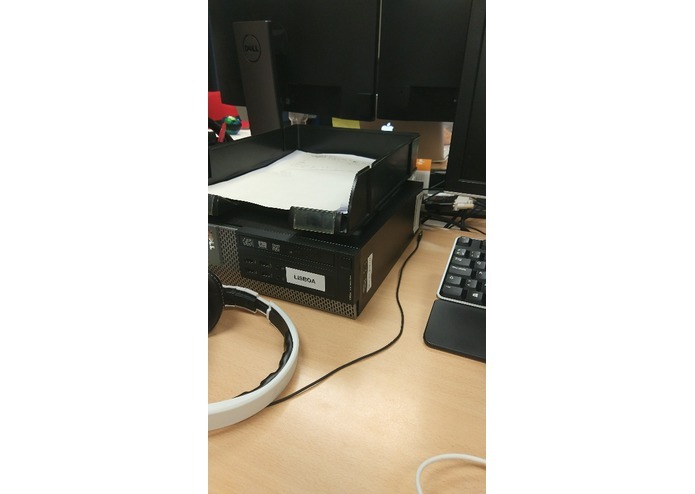 On the Android side we used Android plus some more libraries like IBM Watson and one OCR to convert images to text. All our showcase is complete. 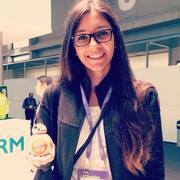 We are proud to say that we have accomplished a MVP in just 36h. 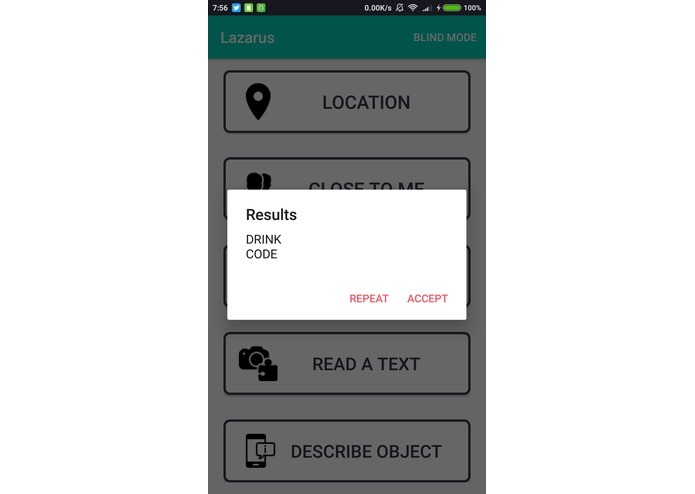 We improved our skills in Flask + Android. 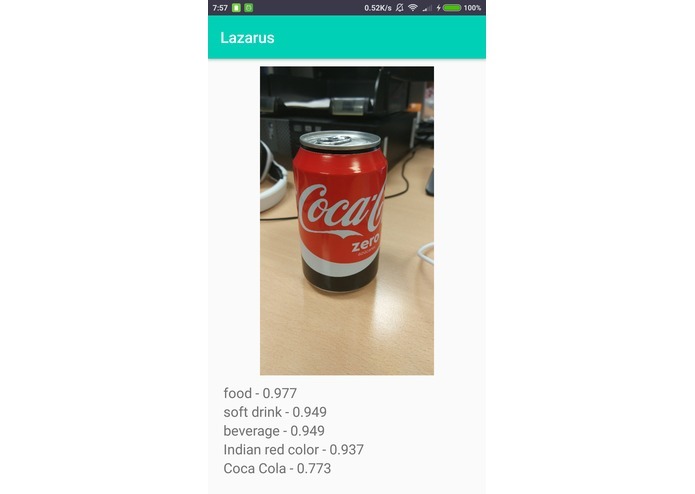 And we learnt how to use the IBM Watson in Android. Beeing able to have OCR + ML with Watson in 24h.